A nice little dinner, if I do say so myself. Seafood is known for being delicate in flavour. Fried potatoes – not so much. This may not sound like a marriage made in heaven, but the the seafood and rösti do go together in a most wonderful way. 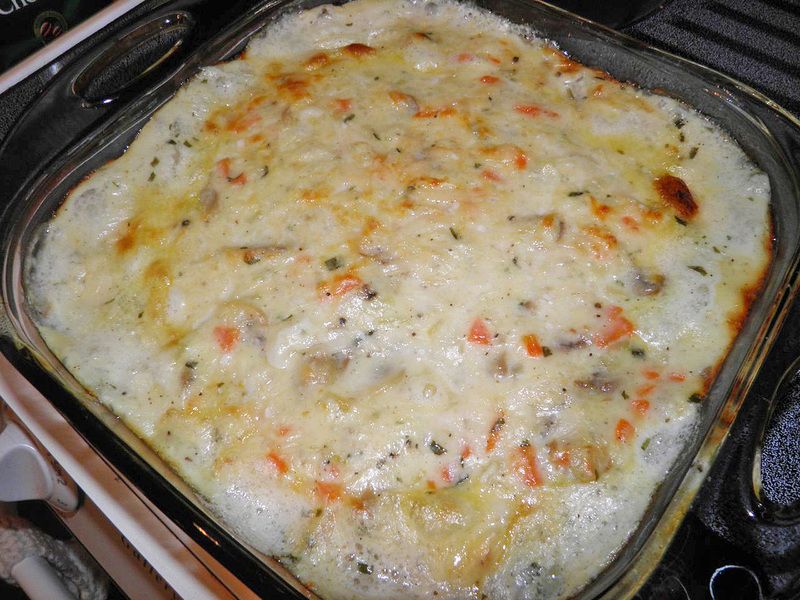 Seafood béchamel is a delicate concoction of various seafoods that is baked in a creamy sauce. I gilded the lily by adding some parmesan. To add a little more veg to the dinner I started off with a mirepoix. That's French cuisine-talk for a vegetable flavour base usually consisting of celery, onions and carrots sautéed in butter (of course). Things aren’t quite as daunting in the kitchen when they’re explained, are they? Simplicity itself. 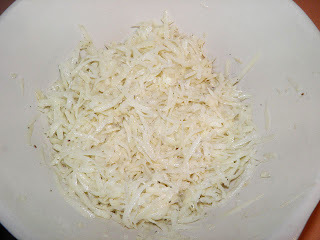 Grated potatoes and onion, salt and pepper. What on earth is rösti? Rösti is a fantastic dish of German-Swiss origin. It’s essentially grated potatoes and onions that are pan fried in a little oil (or fat). Mmmmmm… This is an excellent variation on baked or boiled potatoes if you’re in need of a break from either. Many ingredients can be added to the basic recipe, including bacon, cheese, apples, herbs, etc. Traditionally it is served in German-heritage Switzerland as a breakfast accompaniment. Think of it as sort of “home fries.” It could be easily topped with a poached or fried egg. Although usually fried, rösti can also be baked if you're worried about the extra fat or oil – but it's potatoes already so why worry... I usually pan fry it as one very large rösti but it also can be divided into individual portions before cooking. It's your choice. If done properly rösti is a just-cooked, crusty, delicious, different accompaniment to your dinner. Because it’s essentially potatoes it can also stand up to much heartier fare than seafood. In fact, seafood is probably the last thing people would consider pairing it with. But it works – and works well at that. I hope you enjoy! The seafood is "just" cooked. Preheat the oven to 400°F. Melt the butter in a sauté pan. Add the onion, garlic, mushrooms, carrot and celery. Sauté in the butter until the vegetables have softened. The mushrooms will absorb some of the butter. Then add the additional butter and sprinkle with the flour. Mix well. Slowly pour in the milk, stirring to prevent lumps from forming. Stir in the tarragon, salt and pepper. Taste and adjust. If the sauce seems a little thick don't worry. Juice from the seafood will come out and thin it while baking. Place the cubed fish and whole shrimp in an oven-proof dish. Pour the béchamel on top and then sprinkle with the parmesan cheese. Bake for 30 minutes until golden on top. * Any combination of fresh seafood can be used including raw lobster, scallops, oysters, salmon, sole, tilapia, and so on. Just make sure the weight volume is the same as listed ion the recipe. NIcely brown on both side. Cut into wedges to serve. Grate the potatoes and onion in a bowl. Squeeze out any excess moisture with your hands. Mix in the salt and pepper and parmesan. Heat the oil in a frying pan on medium high. Press the potatoes into a flat round in the hot pan. Let cook until well browned on one side. Loosen underneath after a few minutes to prevent burning. 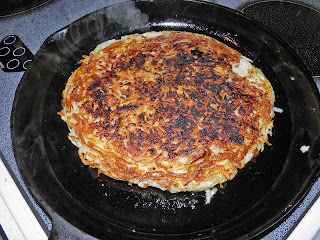 Then flip the rösti and cook on the alternate side. Add more oil if necessary. Cook each side for about 8-10 minutes, taking care not to burn the surface. You do want a nice from crust, though. 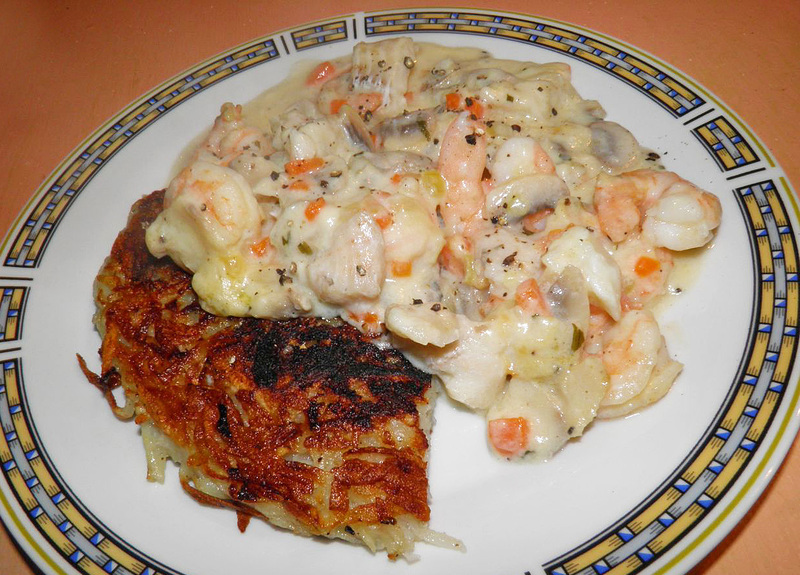 Serve a wedge of the rösti with the baked seafood on the side. Sprinkle with more parmesan if desired.